Combining my poetry and photography has been a basic, perhaps even the primary, element in the development of a touch of william. 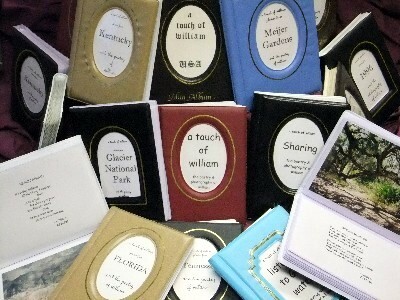 Until suppliers stopped producing my book size, I made and gave away well over a thousand individually created a touch of william (3½"x5") Poetry & Pictures books over the years. Each book typically had between 24 and 36 pages, with a poetry content ranging from 8 to 15 poems. While I cannot give you a uniquely personal online book, it is my hope that by creatively combining my poetry and images in a variety of expressions, somewhere throughout this collection, your life will be touched in a special way. Click on any photo below to begin your journey. Icons are shown (left to right) in the order they were added to this website except "The Starting Point" and "The Last Step" (which I move when something else is added, so it literally remains the last item on the index). The updating of a page (as I have learned better ways of doing things) might make it appear to be out of sequence, but all, other than those two mentioned, have retained their original position. If you are looking for a specific poem of mine, I have added an alphabetical list of titles below the picture index for your convenience. The initials in front of the poem title reference the online book (or books) it is in and serve as links. The six numbers in front of the poem title are the date upon which it was written. My computer files and hard copy pages are organized by the date. For those of you who are viewing the books with an 800x600 screen resolution like I use, remember that pushing F11 on your keyboard (top row) will with most browsers give you a full screen view. This should make it easier to see the poems and pictures together. Note for novices: Do not worry when all your control buttons disappear. Moving your mouse along the edge (usually top) of your screen will drop down what controls you need to exit, go back, etc. When you are finished and ready to exit, pressing F11 a second time returns everything to your regular view. a poem or a P&P book (page) with someone else please click here for instructions.